What Have Readers Said About Julie? Welcome to another post of the Julie Kagawa Month. Today, it is time for me to review The Iron Queen. WOW. Just wow. Julie Kagawa did it again! I loved everything about this book. Unpredictability. Romance. Adventure. You name it! 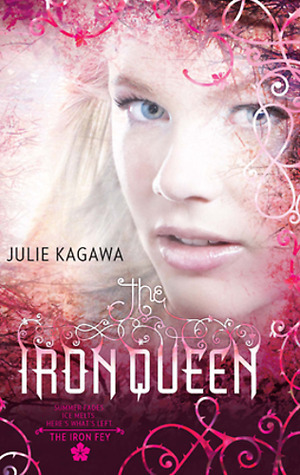 I have never read a book that has made me as deeply emotionally attached as I am with the Iron Queen. Just when you thought you had gotten to know all the characters well, you learn even more about them. I've really enjoyed watching them grow over this series, especially Meghan. With so many responsibilities on her shoulders, she proves to be a strong and determined heroine. We get to see her relationship with Ash grow and flourish. We see how loyal and brave she is, and how she becomes a great leader. First of all, Julie Kagawa’s writing has improved with each book. I found everything to flow smoothly, dialogue sounded natural and her descriptions were amazing! Second of all, The world building is unreal. Unreal! Nevernever was so vivid in my mind, the way she described both the characters and the setting were beautiful. And the ending, OH MY. The ending was..... heartbreaking, touching, to die for. It almost made me cry! And I never cry. Mrs. Kagawa... I love your series. They are awesome books. I didn't read it yet... but the first one was so great... awesome review!!! I still need to read his series, and don't hate me for not reading reading it yet. I've only read THE IRON FEY so far and loved it! Love Kagawa! This is a fantastic giveaway! I've read the first two books of the Iron Fey series and I adored them - just need to get my hands on the next books!